Ask any seasoned marketer, and they'd agree: Understanding your customers is largely dependent on understanding how they think. Your digital marketing strategy should be guided by your answers to certain questions. What do your target customers need? What do they want? What can you do to influence their decision-making process? Take social media engagement, for example. The importance and impact of social media on any business's overall marketing strategy has been discussed ad nauseam, both here and all over the internet. At nearly every speaking engagement I've been invited to, I've had to discuss how being on social media can benefit brands and businesses. Chief among these is the level of engagement you get, which is basically how involved your fans and followers are with you on social media. Social media engagement may come in the form of click-activated reactions (such as the Facebook like button), shares (retweets on Twitter, regrams on Instagram, and so on), and responses (comments on your LinkedIn status updates, for example). However, while it's natural for engagement to be expected on social media, the level of engagement tends to vary based on a number of factors which may or may not be within your control. You'll notice that not all of your updates are equally successful, and that some will generate more engagement than others. Now, here's the question - what is it, exactly, that prompts your social media followers to engage with you via your updates? In his book 'Influence: The Psychology of Persuasion', Robert Cialdini identifies seven key influencers of persuasion. Since generating engagement on social media is basically all about persuading your audience to respond to you, I thought that a close examination of these seven crucial factors might help better understand what motivates an online user to engage with you or your business on social media. As Simon Sinek famously said in his TED talk on leadership, "start with why." Give your target audience a clear reason to engage, and I guarantee you that they will. By "give a reason," I don't just mean the usual calls-to-action or questions (in fact, too many questions may even have a negative effect on your engagement rate, but I'll get deeper into that shortly). Talk about the significance of your offerings, and how they can be of help to your target market. The only thing that differentiates you from your competitors, is you. Share your why story, why do you do what you do, why you're so passionate about it. Cialdini argues that, at our core, we hate owing someone a debt, whether it's of gratitude or of a financial nature. The idea is that we're likely to take any opportunity that gets us out of that perceived debt as quickly as possible, even if it means doing something we wouldn't normally do. A good example of this is the unspoken "I'll follow you, then you follow me" strategy employed by many beauty brands on Instagram, who monitor hashtags related to their industry and subsequently follow the accounts of people who use them. This is a form of profiling in itself, as it banks on the likelihood of people who use those particular hashtags to be interested in your offerings. In the same way we hate to be in debt, we also have an aversion to breaking promises. It always leaves us with a nasty feeling whenever we commit to something we eventually neglect to do, and the usual result of avoiding that is to stay true to our commitment. In a way, this is another observable phenomenon on social media. If you don't post consistent updates, your followers are likely to forget about you, or even unfollow. Another example is the Twitter account of the fast food chain Wendy's. Remember how it made headlines a few months ago because of their social media manager's snappy comebacks at competitors and even customers? A lot of people followed that account because they wanted to read those updates for themselves, and some even tried to get responses from Wendy's (often producing hilarious results). There's an interesting snowball effect which you can observe on your most popular updates. The more people that like and share your Facebook update, for example, the higher the chances that other users will follow suit. As Cialdini explains, people are influenced by what others in their immediate surroundings do, and the environment of social media is no different. This is also why there's such a thing as thought leadership. People who build up their credibility and reputation are more likely to amass followers who adhere and listen to the ideas they advocate. This is where personal branding comes in. Customers are more likely to engage with a brand that has a distinct identity that they can relate to. Brands that feel less like faceless companies and more like real, breathing human beings. We tend to gravitate towards people and things that reflect the views, values, interests, and beliefs which we perceive to be important and positive. Know your audience, tailor your brand identity and engage in storytelling - and watch your engagement rise. Let's go back to the example of thought leadership earlier. As a thought leader, you're also perceived as a person of authority, a credible source of information whom your followers can trust. With this sort of reputation, you can enjoy a higher level of engagement - whether it be from fans who share your insights with the rest of their network, ask you questions to find out your opinion or recommended course of action, or click the like button to silently agree with what you say. In other words, as an authority, you would have no problem establishing and facilitating a conversation between yourself and your audience. The simplest example of how scarcity affects engagement is when you post limited-time offers or contests on your page. People are more likely to ask questions, join your contest, or directly buy your products if they know that they're working within a limited timeframe. Create a sense of scarcity to subsequently create a sense of urgency. Now that we've taken a more in-depth look at the factors that influence social media engagement, let's examine some concrete examples of social media marketing updates that can get you the right kind of attention. Updates that trigger an emotional response - Post updates which make your audience feel something. A car brand that posts dramatic advertisements for an awareness campaign on driving safely is a good example, as those can elicit an emotional response from its followers who may feel sufficiently touched by such posts to share or comment on them. Relevant questions for your target audience - You can put up a poll, ask your followers about their opinions on a specific issue, or even turn it into a giveaway or contest. A sense of humor. You can share funny images or memes, jokes, or humorous articles that your typical followers can appreciate. Be warned, however, that there is such a thing as too much when it comes to sharing humorous content if you want to be taken seriously in business. A contrarian point of view - Present an opinion on a hot topic that runs contrary to the opinions of the majority. Don't be afraid to receive negative comments or dissenting opinions, because those still count as engagement. Compelling storytelling - Tell a story with your updates. On platforms such as Facebook, where there's no character limit, you're free to write long status updates that give your followers more insight about yourself. On Twitter, the workaround is to post a series of tweets that connect to form most contextualized thoughts. Either way, your updates have to be compelling, and share information with your audience in an interesting way. Newsworthy content and updates - You can pull news updates related to your industry from credible sources, for example, and share them on your social profiles. You can also provide updates to your followers about the latest events at your company. A consistent presence - Responding to comments and messages is an absolute must, so your audience knows that you're paying attention to them and their inquiries. Keep the page - and your social media engagement - alive by actually being there. Your page is like a garden that requires consistent tending to stay attractive. Having a healthy mix of content topics and formats - Don't be afraid to mix it up and keep your audience interested. You can share content on a wide variety of topics (from personal to business), with different voices (from inspirational to aspirational) and storytelling techniques (text updates, visual marketing, and images). Include a call-to-action - Simply put: If you want people to take a specific action, tell them what that action is. As much as possible, be direct without being too blunt or sounding desperate. If you want people to comment, invite them to comment, but provide something substantial for them to comment on in the first place. Posting a certain kind of update on an ill-suited platform - To succeed at this requires an understanding of the platform that you're posting on, far beyond simply its technical limits. For instance, you're less likely to get engagement when you post a business article on Facebook, because the majority of the professional market is on LinkedIn. You'll get a higher rate of engagement there for business-related posts. Asking a question on every single post - Questions are great, and they do produce more engagement, but asking too many of them can cause fatigue among your readers, ultimately leading them to stop engaging. Posting personal rants, unsolicited opinions, and private information - Sometimes less truly is more. Don't let everyone on social media see your dirty laundry - especially not your customers and your professional contacts. Too much humor - Being funny all the time is not conducive to getting business results. In fact, people might have trouble taking you seriously if you're making jokes all the time. Content that inspires emotion always generates more social media engagement, as does anything that makes people laugh; however, make sure that you're sensitive about what's appropriate and what may be crossing the line. Overall, a stronger social media presence and better engagement can only come from an effective and consistent content marketing strategy. 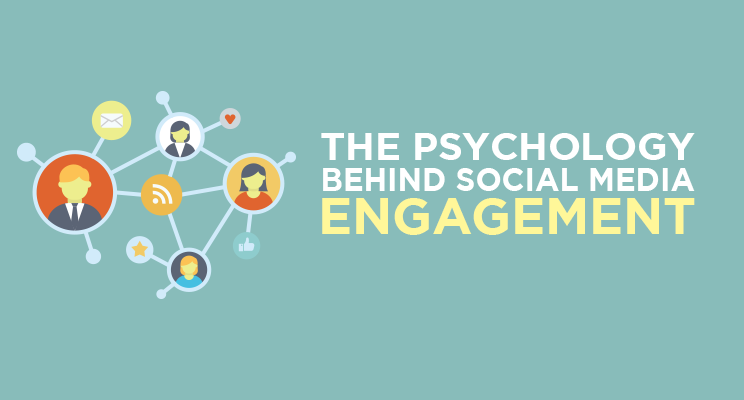 The post The Psychology Behind Social Media Engagement appeared first on Top Dog Social Media.